Thanks to our small budget and pseudo-hispter desire to do things a little out of the norm, Roo and I have been coming up with creative solutions for our wedding. Things like serving food from a food truck and popsicles instead of cake. 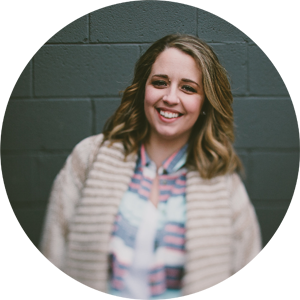 So I’ve been trying to think outside of the proverbial “box” when it comes to decor, too. Already in the works for table decorations are crafty DIY projects involving dollar store candles, plastic succulents and gold spray paint; a trio I realize sounds crazy, but I’m totally confident will look incredible. What I’m not so confident about? 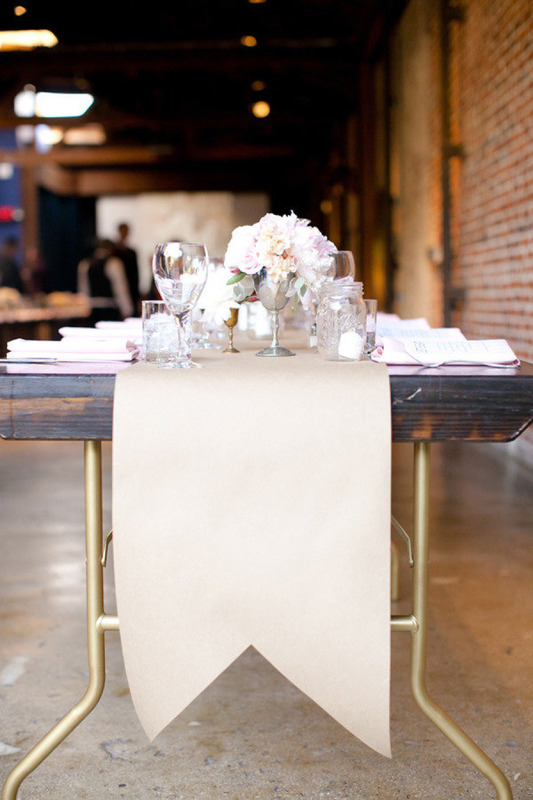 Kraft paper table runners. 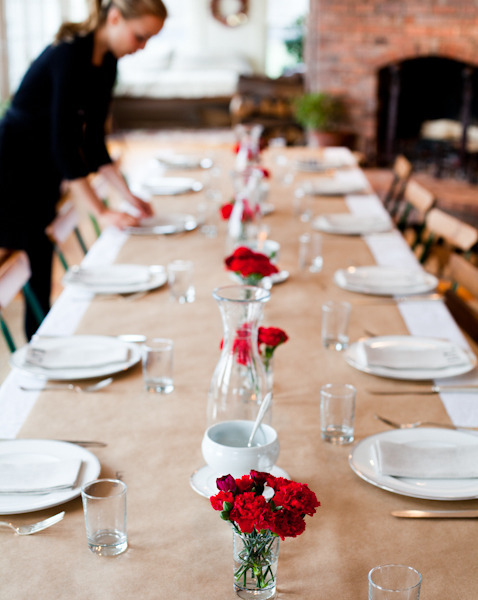 Emerson Fry‘s holiday tablescape via Faye and Co.
We’ll have a mix of tables at our venue—both in style and in size. Among them is a set of four 8-person farm tables, and four extra long picnic tables (which seat 12+). These eight tables in particular are proving to be quite a challenge to decorate. The ideal situation would be to set these tables up with a long line of plush arrangements, but since we’ve decided flowers aren’t a priority for the budget, our centerpieces are going to be a little more sparse and minimalist. Plus, because of the whole food truck thing, there really won’t be anything else on the tables but the centerpieces. No plates, no napkins, no silverware. 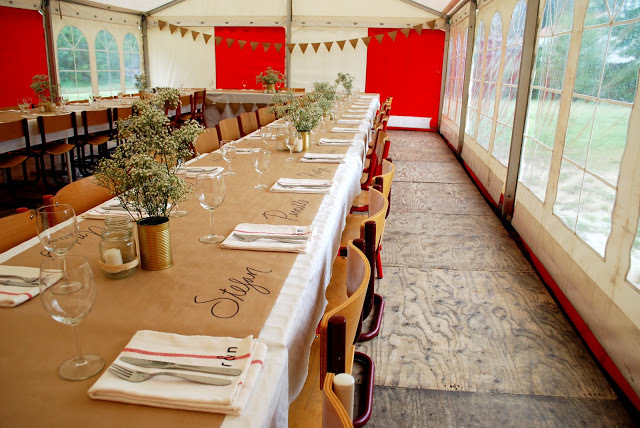 I want to use table runners to play up the length of the tables and bring some cohesiveness to the decor, but I can’t exactly find anything long enough that fits our budget (especially for the huge picnic tables). So I had an idea. 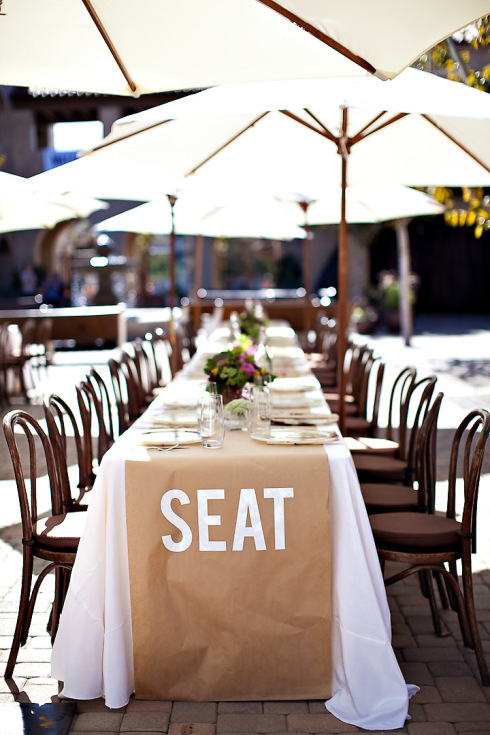 Kraft paper table runners. We used “brown bag” paper all throughout our invitations, so why not bring it into the event? I could buy a roll of 18″ wide paper and cut it exactly to size to fit every table in the joint. And it would only be $30. That’s, like, negative money to a wedding budget. But I keep hearing that voice in my head. “What was she thinking? !” I want it to look casual and cool. Not crafty. I want it to feel like you’re at a swanky lowcountry boil hosted by an up-and-coming local chef where everybody’s wearing gingham and really nice leather watches. Not like the kid’s table at Macaroni Grill. I found tons of proof online that it can work. But even though I love the way it looks in these photos, and I think it would be perfect for the vibe of our bash. I can’t quite commit to the idea. What do you think? Cool or crazy? Also, does anybody have any advice for making decisions quickly and confidently? I just can’t get it together, even this late in the game.